If you're a blogger, Google Analytics is something that you hear talked about often. Companies may ask you for some stats from there if they want to collaborate with you, and it's great to understand if you're looking more into who your audience is and how you can relate to and attract them on your blog. If you're a newbie, or even if you've been in the blogger game for a while, GA can be extremely confusing and difficult to grasp if you don't know what you're looking at. I asked a while ago on my twitter if y'all would be interested in a post dedicated to understanding some of the basics, so here it is! This one is pretty simple. Most likely you understand this one by just looking at it, but lets go over it just in case! It's essentially the total number of pageviews that your blog is getting. This counts each visit someone makes to each page on your blog (think post, about me page, etc), including multiple visits to a page by the same person. The number of people visiting your blog! New and returning users are counted here. This one's a little more complicated, but not by much. It's the number of visits to your blog within the date range that you've set on your GA page, but it doesn't count if a person clicks through into different pages on your blog. So essentially it just counts the number of visits, but not the pageviews. It's a little complicated, but if you have questions about this one let me know! This is the percentage of times you have readers coming to your blog and only visiting one page. I've heard that the average bounce rate is 40%-60%. You may be thinking "Wait, isn't it bad that people aren't going past a single page on my blog?" Not always, no! Think about the amount of times you're promoting one blog post, you want them to visit that specific post, and so they do. They may be searching for a specific thing on Pinterest and your single post gives them the exact information they need, so they don't have to go further. If you're really concerned with lowering your bounce rate though, my best piece of advice is to link back to old posts within your newer blog posts. This. is. your. audience. For me, this is one of the most important thing that GA can tell me about. It tells me what types of people are visiting my site and how I can cater my site to better fit them. To find your Demographics go to Audience –> Demographics –> Overview it's that simple. There you can see the age and gender of your readers. For me, I know most of the people who read my blog are young women in the 18-24 year old range, which tells me that college and school posts are a great fit here on TCB. If I were to suddenly change into a mommy blog (not happening ANY time soon, no worries) I know that my audience wouldn't really be interested in that. Get here by going to Audience –> Behavior. I look at each of the three categories listed here, but engagement is where I focus. I want to see how long my readers are on my blog, so I can try to make them stay a little longer and visit some more pages. This is how your readers are getting to your blog. It's a separate category on its own in the left side bar, and I like to start by looking at the overview. It can tell me if people are organically searching for my blog (google search of a specific topic and find my link), direct referral (click on a link I posted or type my URL straight in), are coming from social media, or somewhere else. I like to click on the tab called Source to directly see where my traffic is coming from. A lot of my traffic comes from Pinterest, so I know it's a great tool to keep investing in, but I should also look at the areas where I want to increase my referrals. So those are the basics! From there you should be able to tell brands that want to work with you who you are writing to, what your numbers are, and how best to get readers to your site. It will also be super easy to create your media kit with these tools. If you have any extra questions I'll try my best to answer them. As always shoot me an email at theclassicbrunette@gmail.com or leave a comment! Thanks for the tips to success! Thanks for this simple explanation of Google Analytics Sami! This is great, I'm not 100% on Google analysis yet so this helps a lot. Thanks so much! I definitely recommend getting on GA and then understanding it later, the more information you have, the better! Thanks so much for this great info. 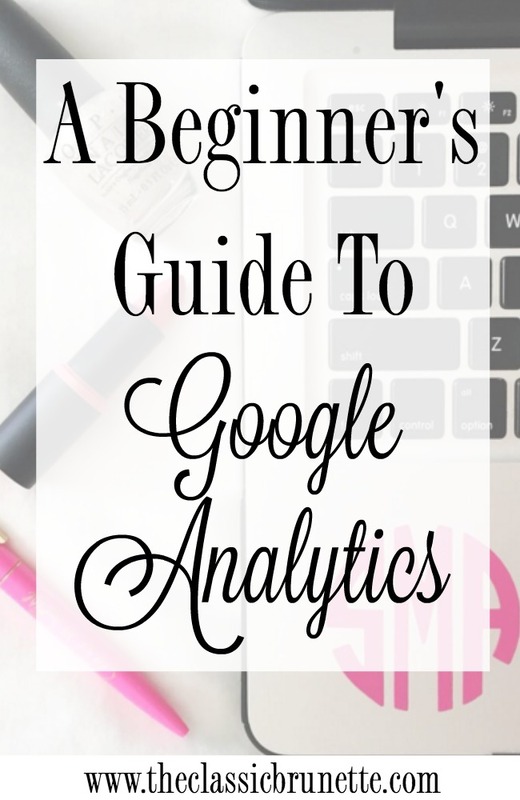 I haven't gotten involved with Google Analytics yet because its a little over my head but this is very helpful! Thank you! I recommend adding GA to your site just to get the numbers rolling in, even if you don't understand, so that you'll have more information when you do start using it! Super helpful post! Do you use the Google Analytics on Wordpress or just their direct website? Thank you so much! I'm actually off of Blogger, not Wordpress, so I use it off of the direct website. Thank you! I hope it will, it's just the basics, but it's definitely worth knowing! I definitely need to get better at understanding and using Google Analytics! Great post, thanks for sharing! Bounce rate is were I am struggling I need to link within more! Great overview!! Yeah bounce rate is definitely tricky! I'm guilty of not linking within more too. Thank you! This is so helpful! I'm still trying to get the hang of GA. Thank you! You'll get it eventually! There are still a lot of things I'm not sure about on there! OMG Thank you for this! Google Analytics can be sooo confusing sometimes. This is a big help! I've been trying for ages to understand GA. This is definitely helpful! Thank you so much! Glad I could help you, even if it's just a little bit! Great explanations of everything! GA can get tricky with all it's complicated lingo. Thank you, it's definitely been difficult to grasp some things! I'm finally starting to understand all the in depth stuff of GA, thanks to you! Amazing post, per usual! Such a great post! Google Analytics can be so confusing and daunting when you start getting into it. Thank you!! It really is confusing at first. This would have been so helpful when I was learning Google Analytics! Thank you for sharing your wisdom with other bloggers! Such a helpful post! Google Analytics can be pretty overwhelming to say the least. This is so useful, nice post! SO helpful! Google analytics is confuses me and I've had it for a while now. Thanks for sharing your knowledge with us! Pinning this for feature references! Thank you so much Amy! It was super confusing for me until I went on a search for resources, haha! What Great tips Sami!! Im going to use these tips, Google analytics is rough some times! So true! It can be so hard to figure it out the first couple of times. Great guide! This is a very good start to Google Analytics basics! I use this platform on a daily basis for work and you covered the essentials.